Several law-enforcement agencies have spent much of the day Wednesday looking for a missing 90-year-old man. At about 4:20 a.m. Wednesday, the Nebraska State Patrol issued an Endangered Missing Advisory in Eastern Nebraska for Charles Folsom, 90, reported to Fremont Police as missing by his wife on Tuesday night. Agencies have been searching for Folsom since before 8 a.m. Wednesday. 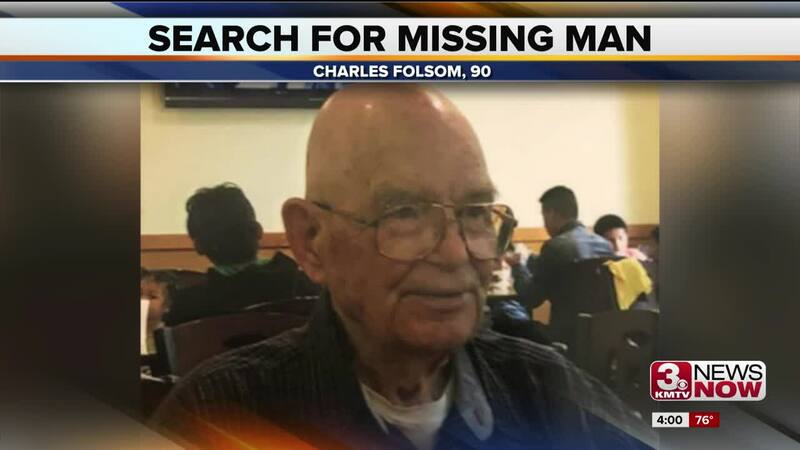 The Fremont Police Department said Folsom was last seen around 11 a.m. Tuesday and is wearing a black and white checkered shirt, black pants and has a sling on his right arm. He's described as 5 feet, 9 inches tall and weighing 145 pounds. His vehicle, a gray Chevy Equinox was found this morning about 10 miles outside of Fremont next to a cornfield near the Elkhorn River. More than 60 volunteers are out searching the area for Folsom, and authorities have also deployed boats, helicopters, and drones have been deployed to help find him. Fremont Police Chief Jeff Elliott said the search so far has been difficult because of all the corn fields. Police say the man's age in a concern, as is the fact that he had shoulder surgery about a month ago.